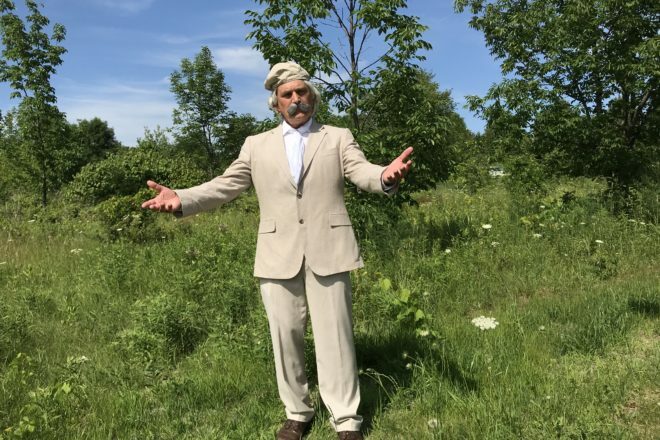 A huge crowd at an event in late August at the Baileys Harbor Town Hall saw Roger Kuhns go backstage with a tan suit over his arm. But the man who emerged wearing that suit a few minutes later looked and sounded nothing like Kuhns. Who he did resemble to an uncanny degree was 86-year-old Jens Jensen – a bit stooped, with a bushy grey mustache, unruly white hair under a tan beret and a white silk scarf, fastened at the neck with a silver ring. He spoke for an hour in an accent that never faltered. The year was 1946, five years before Jensen’s death. Jensen related that he first came to Door County, looking for a place in the country. His wife, Anne Marie, was beside him in their Model T; his secretary, Mertha Fulkerson, and the Jensen children were in the back. Jensen backtracked a bit to explain that he was born in 1860 into a farm family. As a young man, he was conscripted into Kaiser Wilhelm’s Royal Guard and sent to Berlin, where he was fascinated with the beautiful parks – the inspiration for his career as a landscape architect. Later he fell in love with a young woman who worked in his parents’ household. 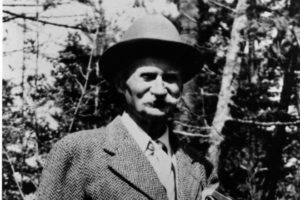 As the oldest son, he would have inherited the farm, but his father forbid his marriage to the “town girl,” so, in 1884, Jens and Anne immigrated to the United States, with 15 cents in Jens’ pocket. Anne Jensen died in 1934, and the following year Jens moved to Ellison Bay and founded The Clearing Folk School. Mertha Fulkerson, whom he had hired when she was 19, vowed she would not go because there was no plumbing and no running water. But she went and she stayed. But Jensen’s soul mate, the person who shared his deepest feelings about the spiritual power of nature and the need to protect and preserve it, was Emma Toft. “When she walks, it is like she is floating through the woods,” Jensen said. “As we walked at Toft Point, she said, ‘Mind where you put your foot. There is somebody living there.’ She respected nature, but there was a little bit of vinegar in her. If your ideas didn’t agree with hers, she would let you have it. “She’d make those Swedish pancakes with chopped apples and nutmeg and butter, and I could stay there for a long time. And, oh boy, we’d talk about all sorts of ways that we would improve society. Jensen appeared courtesy of the Baileys Harbor Historical Society, The Clearing, Friends of Toft Point and The Ridges Sanctuary.